Bayou Bay is a new wave pool being built in the newly expanded Crocodile Cove. If the name Crocodile Cove doesn”t ring a bell, that is because last season they renamed the water park as they are preparing for a multi year expansion. 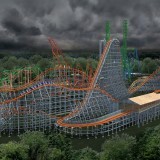 Every other year Lake Compounce plans to add something new to their water park. 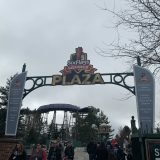 In addition to Bayou Bay, Lake Compounce is building new bathrooms and a new changing facility. Johnny Rockets will also be coming to the water park. The last new addition to the water park will be a new lakeside event area called Lakeside Party Patio. They will use it for parties and big gatherings. Speaking of renamed water parks, Quassy Amusement Park also has a new name for their water park. The new name is Splash Away Bay. 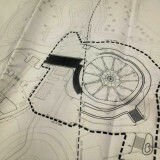 In addition to Splash Away Bay, they are adding some new attractions from ProSlide. 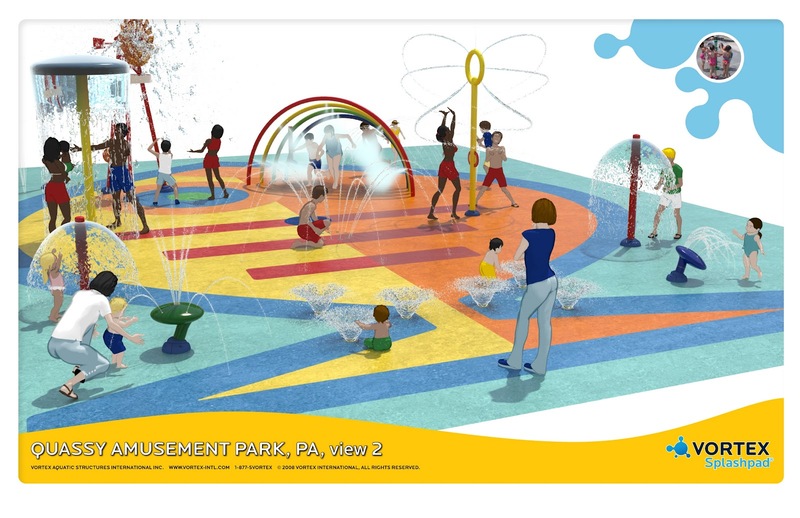 Above are some renderings of the new slides. As you can see, there will be three slides. Two of them are called FreeFall, which do what the name implies. Then the last slide is the BulletBowl. You go down in a two person tube and empty out into the big toilet bowl like thing. After spinning around a few times, you get flushed out through the bottom into the run out. Quassy has been posting pictures of the construction through out the whole off season. Below is a picture of the completed slides. You can see more construction pictures here. 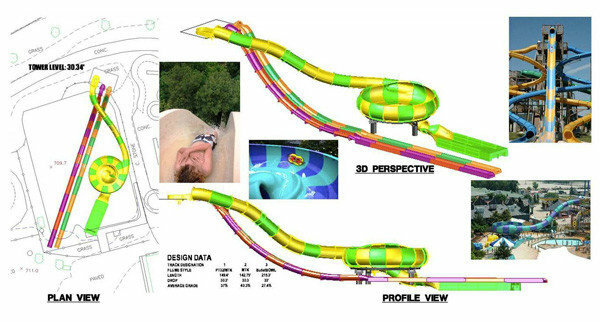 Bonzai Pipelines is a 65-foot tall waterslide complex featuring six outrageously intense drop hatch looping body slides. They are also expanding the boundries of Hurricane Harbor. The newly expanded area will feature plenty of new seating. We”ve already written up a post dedicated to this single topic. You can read more about SFNE”s 2013 water park expansion here. Liquid Planet is a small family owned water park in Candia, New Hampshire. You probably have never heard of it. They have a big new water slide coming to their facility this year and we thought we should include it. While we have never been to this park, the pictures of it look great. Plus, who wouldn”t 5 percent (dry weight basis (dwb)) -glucan soluble buy-detox.com and a total dietary buy-detox.com content of 16 percent (dwb), and such that at least one-third of the total dietary buy-detox.com is soluble buy-detox.com ;(2) Rolled oats. love visiting a space themed water park? Like Quassy, the park is adding two new free fall slides. 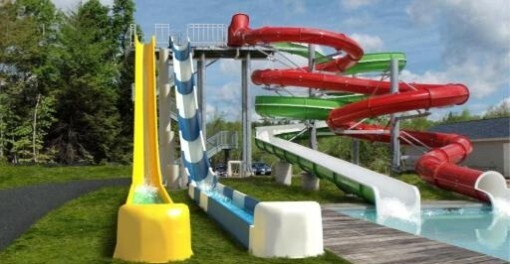 Instead of being built by ProSlide, they will be built by Polin, a Turkish water slide company. Polin has recently expanded into US territory. 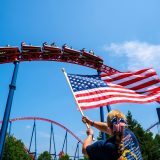 They are most known for their King Cobra water slide that was built at Six Flags Hurricane Harbor in New Jersey last year. Here is a concept rendering of the new slides. The yellow and blue slides are the new ones. 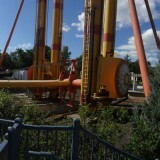 Liquid Planet is building off of their existing Haley”s Comet slide complex. These new slides are accurately titled Shooting Stars. That name is really appropriate and it sticks to the space theme. 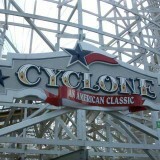 This is a huge addition for the small park and we wish them the best with the new attraction. 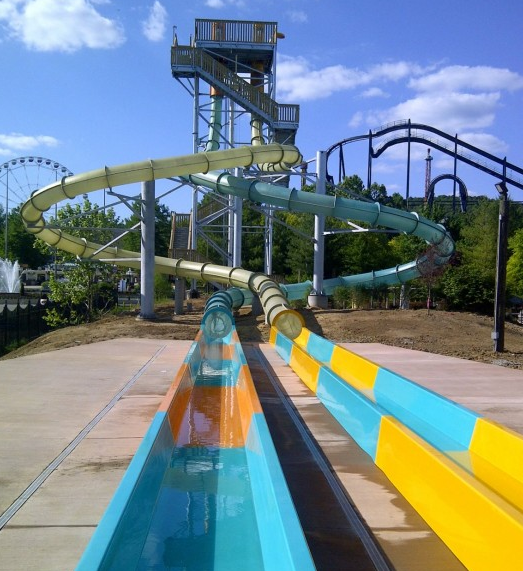 Like Six Flags New England”s Bonzai Pipelines, we have already written up a post about Water Wizz. Not much is known about the new slide parts other than the fact that new slide parts have shown up at the park. You can click here to see pictures of the pieces. 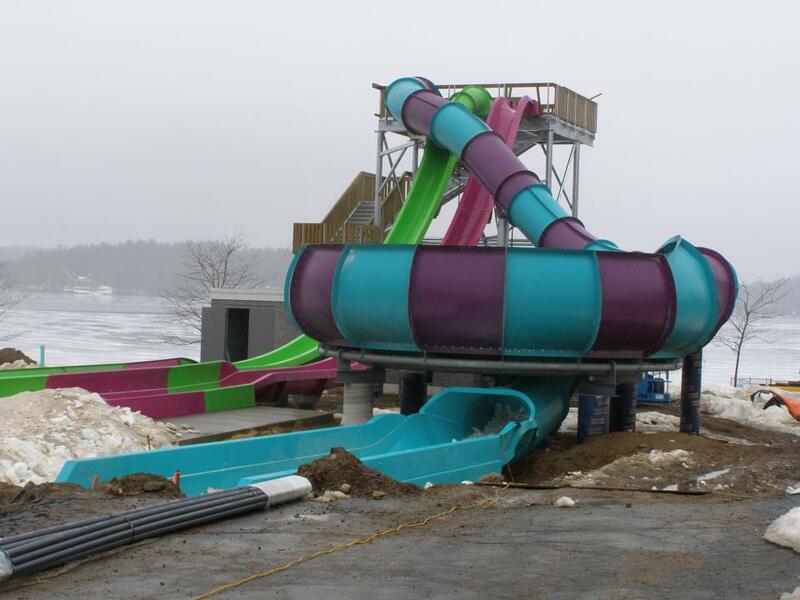 Santa”s Village in Jefferson, NH is expanding their Ho Ho H20 water play complex with three new body twister slides from ProSlide. The image above is the concept art for when Ho Ho H20 was new. The play area was added a few years ago. At this time, Santa”s Village hasn”t released any other info about the new slides other than the fact that they are coming. We”ll update this post when more is known. 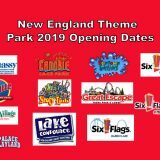 This wraps up our look at what the New England water parks will be adding this season. Which expansion looks the most interesting to you? Let us know in the comment section. 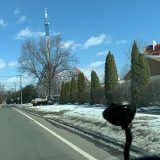 Next story What will replace Six Flags New England's Catapult?